Wasn’t such a little thing, really. Behn's last name was Su'Todai. His wife is named Thei Foh, and his children are Voh and Pe Geh. Holy Goddess. I hope the human government found something to charge those idiot fishermen with. Fishing him up is one thing, but killing someone wearing clothes and actually speaking? Forget not recognizing him as an intelligent being, they didn’t even recognize him as weird enough to call a zoo about. Makes me wonder what other kind of fish they were coming up with. Probably something endangered, so they had to silence him. And then after, of course, he was a “merman corpse” to earn money off of. Probably safe to assume the Sarnothi guy wasn’t speaking any language they understood. So that’s why they banned fishing. It was to prevent a war with the Sarnoth! This strip makes my heart ache, Dave. I think again, you’re doing a good job pulling readers in, emotionally. Pohl’s brevity, coming right out with the facts in this manner, packs more of a punch than something wordier. PROCESSED him??? I had to step back for a moment and remember that this is only a story. Because that just slapped me with disgust, rage, and sadness all at once. How awful! I don’t think processed means that they put bits of him in the canned tuna. I think it just means that they put him in with the rest of the fish, and didn’t let him out. I think someone at the plant, if not before, would realize it wasn’t a fish, especially since the tabloids got ahold of it. That doesn’t make it any less sad, though. Oh. Never mind. I’ll shut up and stop pretending I have know anything about fishing. I always had the idea that they *did* gut and clean him! and that is what sparked the revolt. I can defiantly see why the Sar’teri would be angry enough to start a conflict, regardless of the cost to the city and their clan. Even if the incident didn’t warrant a full-blown war, when such potent outrage starts brewing it’s already too late. And perhaps the reason why the Sar’teri hate Selkie’s clan is because they were strictly for the “Don’t go after the humans; it’d be way too dangerous!” ? Back when we learned that an “event” had started all of the troubles, I assumed it was something along those lines. I vaguely remember reading headlines in the “Sun News” back when that sort of thing was at eye-level in the grocery store checkout. 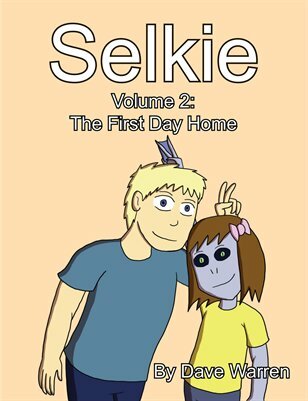 If you check the text of the “Merman” story on this page; https://selkiecomic.com/comic/selkie221/ it DOES say they “cleaned” him – so, no, you aren’t reading too much into that phrase. Technically, I believe that’s a gaff. Aaaand it is time for the vodka. Comics should not make that need to be a thing, but I guess it is good when they do? Wow. That would have a tendency to start a war, although I would have expected something like that to trigger a war with the humans, rather than each other. And it doesn’t really explain why they targeted the artists. this is pretty distressing, I’m so glad this is only a tale. As for the fishermen, he’s WEARING CLOTHES! How stupid and cruel do you have to be to just continue on and gut him! Um … stupid and cruel is, sadly, a default for many of us humans. Think about what we’ve done over the years to people who wear clothes and are in fact the same shape as us, but just have different skin, speak a different language, or worship differently, or even just look at us funny. Sadly, as with the snowball fight debacle, this is all too regular behavior for the group being presented. And “only” a tale? Are you talking from the perspective of someone like Todd or a reader? Because from Todd’s perspective, this isn’t a tale, this is history. Secret. Moon bloomin’. History. It’s possible that he wasn’t wearing clothes in the event, just for the sake of modesty in the flashback. Still, the butchering of a humanoid creature is generally frowned upon, especially in America, imagine someone trying to serve you chimpanzee meat. Playing Devil’s Advocate here, it can be difficult to meaningfully analyze and interpret the cognitive and emotional states of other animals and unhelpful or dangerous to interpret their states in human terms (for instance, a chimp who is happy will not grin, among them that is an expression of open hostility that has done great harm for many a well intentioned caregiver or explorer). Many animals, including many species of fish, don’t appear to form and navigate social bonds the same way many mammals do (there are even exceptions among mammals: Lions will /murder/ children that aren’t their own). In particular, fish at large don’t seem to do much with child rearing or pair bonding beyond trying to find a safe place to stow the next generation, and those that do often exhibit other behaviors which are alien or even frightening to us. This isn’t to say that fish don’t feel…they obviously experience and respond, but in general I would infer from what I’ve read and observed that most are too concerned with immediate survival/impending death to devote much cognition to pleading with their predator to spare them on behalf of their families…in their normal environment, it’s of no use to them so why would they recognize us as something that could show such abstract mercy, let alone do so on their behalf? To them, we are unfathomable monstrosities that turn their world as mad as a Shoggoth’s maw. This gets into the bleeding edge of inter-species morality. I am of the belief that we are not alone on our own planet…I am certain that, however alien, the creatures I live with and consume have experiences I can in some way relate to and understand. But as an animal myself I am still faced with the need to eat, and one can only break down the question of killing to survive so far before one must choose to eat or die. Shall all that eats elect to die for fear of pain? Shall all of creation close it’s eye to itself, because it sometimes suffers? The best compromise I can offer is, if one must kill to live, be not unkind. Sometimes, it is inescapable that we will do harm…particularly when we do not understand how to show the mercy another creature needs. But we can avoid intentional cruelty, and we can learn how to live without unnecessary evil. May I quote this elsewhere? It’s spectacularly well-said. I eat meat both for medical and alimentary reasons, but I struggle with the fact that a living thing died for my meal. The wonderful book “Never Let Me Go” by Kazuo Ishiguro is very much in line with the spirit of your remarks. There is a *lot* going on below the surface of this comic (pun not entirely intended) and I really admire the creator for engaging with such complex themes. That was a well thought out and superbly expressed sentiment. To add to your comment, I believe your prognosis is already being carried out. Still doesn’t stop us from eating 42 billion chickens every year. :-9. Back for Culture Nerd picking apart innocuous comments-time! Pohl says “spirits” in the fifth bubble. This seems to imply the Sarnothi are animistic or perhaps practice ancestor worship. Or maybe they’re just polytheistic and Pohl’s fuzzy on the line between the words “spirit” and “god” in our language. Or, he’s a devout alcoholic who worships Whiskey. But what happened to the fishers? As an offering to help restore /some/ faith in the bank of human decency, I would like to say that most of the people I know and know of are more like Todd and many of the commentators in these threads in that they would likely accept the insertion of a non-human sapient species into their daily lives as a matter of course. Certainly, they would all most likely know one when they saw one, and not clean and pose with it like a tuna. Cold comfort to Behn’s family, I’m sure, but I do hold a measure of informed faith that in the long run this sort of thing can end well. All of us are not as monstrous as some of us, and most of us are getting better at being human every day. Remember, when we must indict humanity for it’s sins, that George and Todd are also humans who looked at Selkie and saw a person like themselves. Their neighbors, the Ikaris, the landlady, Todd’s extensive family. The caretakers at the orphanage, the teachers at the school. Even Selkie’s staunchest adversary sees her as a rival, a person to be fought not a monster to slay or a trophy to stuff. A couple of sociopathic fishermen is not representative of the species, only the worst of our failures. With 7,800,000,000 people in the world, extreme outliers are an inevitability. Even if there is just one homicidal sociopath per every 100,000 people, that still equates to about seventy-eight thousand sadists running around. I for one would applaud humanity for keeping the ratio as low as it is. I’m not sure those fishermen are safe for humans to be around. Not only are they some sort of sociopath, but I figure even most people that are heartless enough to not consider a non-human sapient a person would default to sideside like exploitation of the live specimen… rather than go straight to gutting it. Are we going to find out later this fishing vessal was run by pack of serial killers? I think it’s more likely that they were just dead stupid. That level of ignorance is almost more sad and frightening to me than outright badness. It is possible the scenario was more of backwoods townfolk faced with their very own “Frankenstein’s Monster” and mob mentality took over. In other words, the thing they caught starts freaking out and probably not speaking their language (as Selkie’s mother was hard-pressed to speak it when she was supposed to be around humans and leave her daughter with them!) so they see this gibbering man-sized thing who is probably trying to bite or poison/envenomate them to get away and they kill it on principle that it would have killed them if not. You know, the old human adage that if it is strange it means us harm? Yeah. That. Then they gutted it and made it look less human to put their own minds to rest that they did not, in fact, just commit some kind of otherspecies homicide. That’s my take. Perhaps the Sar’teri were blamed for this, and restrictions were imposed on only the Sar’teri… and the Sar’teri self-righteously rose up in response. That’s what I’m guessing anyway. Not realizing he’s sentient makes no sense, like they would have to be functionally retarded to mistake a clothed humanoid (presumably) capable of speech for an animal. Weird, they lived alongside humans.. in modern times? Well…being a freshwater species on a continent that had a fairly low population until recently…they probably didn’t have much trouble from the pre-colonization cultures. But he said “back then we got along with humans” and it’s clearly modern times.. so.. they’re NOT a secret? Fishermen can tell the difference between a fish (such as a trout) and something else entirely, and had they fully intended to simply cash in on finding a “merman” they would have known that he would be worth more alive than dead. However, it could also be inferred that the fishermen merely intended to cut Behn free and let him go, and if this is the case, perhaps Behn saw them approaching with a sharp object and (thinking they meant to do him harm) began to panic and lash out at them. The fishermen would, of course, wanted to defend themselves against such an attack, and so killing Behn could have been a complete accident, but since he was already dead, why not see if there was some money to be made from him? 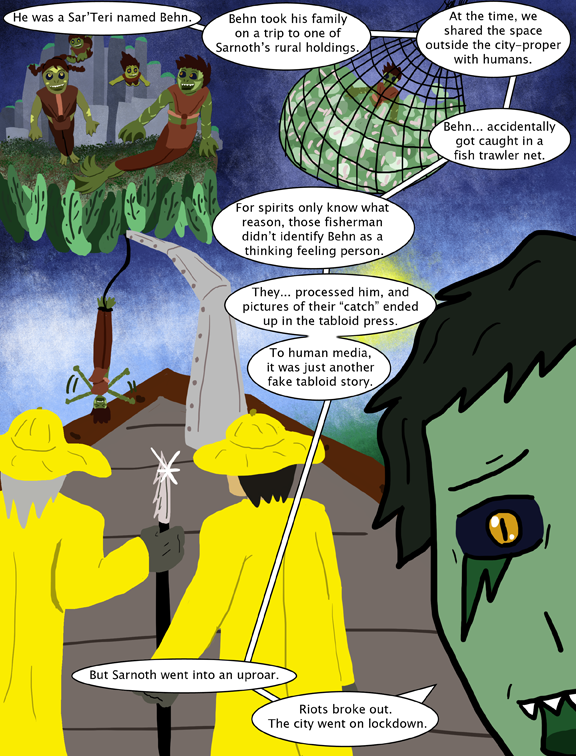 Only thing poking holes in that theory is that [i]human[/i] headline in the previous comic that mentions them posing with their gutted catch. Non-sociopathic people tend not to eviscerate and pose with things they killed in self-defense. Though you’re right, that they’re not necessarily sociopathic. Something people may be forgetting is the Uncanny Valley effect and the basic Humanocentric nature of our biological wiring. It’s great to imagine that, if you saw a gilled, green-scaled, web clawed figure walking towards you on the shore of a lake (or stuck in a net), that you’d be like, “Hey Dude, what’s up?”- after all, we do that sort of thing all the time a conventions and costume parties, and watch it in movies. However, our sensory systems are so good at recognizing what is and isn’t human that even the best costume can’t disguise the fact that it [i]is[/i] a human inside, and let our Reptile Brains know that we’re seeing One Of Us. A Sarnothi will not trigger that instinctual trust. For someone who isn’t used to exercising their empathy and creativity (such as, say, blue collar fishermen), they see this Fish Man and it instantly become the Creature from the Black Lagoon. The first triggers it pulls are “Not Human”, followed closely by “Creepy” and “Fish/prey”, especially if Behn was struggling. They don’t look at the clothes and think “Clothing”, they see “Weeds” or scraps of fabric that this beast got tangled up in. They don’t hear words or sentences any more than you can understand what a howling wolf is saying, just a bunch of chittering or moaning. They see sharp teeth, and feel “Threat”. They see claws and think “Danger, must neutralize”. And Behn’s shape and movements would be close enough to human that, even if they don’t notice, they’re sincerely, severely frightened by it, much like you would be by a Zombie or someone who’s joints all bent backwards. This all adds up to them being highly unsettled, probably drunk, and completely unawares that what they have is even capable of emotion- and so they default to what they were doing at the time. Gut, and take trophy pictures. 1) The species in question has natural claws and fangs as well as being so toxic/poisonous to humans that an innocent kiss causes instant skin rash. 2) Behn was quite certainly in a state of panic at the time. If Behn did accidentally kill/cause serious injury to one of the fishermen either immediately just trying to escape or as a delayed reaction via poison, that would be the number one thing the government would want to keep quiet, and the number one reason for the fishermen not caring whether the thing attacking them was sentient or not. It wouldn’t necessarily explain the picture, but if we’re talking Weekly World News-style reporting, the picture would have certainly been edited in some way and the article would have been written for maximum entertainment with minimum verifiable factoids. ..am I misreading, Dave, or did they actually “process” him as in kill, gut, and filet?? No you are not misreading it. One thing I’m not understanding is that the article says they caught a LIVE merman and posed with it after subduing (this is a word common used when referring to restraining or knocking out a LIVING creature.) it and cleaning it. The cleaning part throws me off because up until that point it implied he was alive? This is a stretch, but perhaps cleaning meant something other than gutting him? Or it’s just something that was poorly worded. Well… now we know where fish sticks come from. That was really unnecessary. Did we really need to drag politics into this?! That’s completely unecessary in every way. You aren’t making a compelling comparison at all and are just trying to be hurtful to others by belittling someone else’s views or opinions. I strongly advise Dave to remove comments that outright target a group pf people because it is highly offensive and bigoted to have to read deragatory comments of ANY group and not just the ‘approved to need to be protected’ groups leaving others as free game on the pretense that it’s somehow funny or acceptable to bash ANYONE. Especially if it’s just because you disagree with them. Freedom and equal rights for all; not just select groups. On another note, had he not been dressed, and had either been killed or knocked out, the fact that he was humanoid-shaped would be the only thing going for him. If he was dead, what would you *expect* the fishermen to do with him? What do you think fishermen do with octopi and other odd critters that end up in their nets? Even he was awake, communication would have been impossible– remember, they speak a different language, which I would surmise is more tuned for underwater acoustics than airborne acoustics. There’s a reason why dolphins sound like they do, folks, sounds travel completely differently underwater. I would assume that anything Behn said would sound more like dolphin-sound or whale-sound. Note that I’m not justifying the fishermen’s actions, but sometimes people can be pretty damn stupid. One of the last videos actually involves fisherman catching a merperson. Although they get so startled they drop their whole catch.